A deeper look at your data can deliver visibility into the performance of your recruiting channels and pinpoint where you need to focus. There is no one-size-fits-all recruiting source – the right channel mix depends on the role, location, department, skills you are looking to fill. To understand channel performance you need to know which sources work best at attracting your quality candidate in the context of your specific business needs. Channel Effectiveness Analytics go beyond overall costs, high-level volume and candidate-to-hire conversion rates, and provide this essential context. “To fill the hiring needs for this department which sources have been most effective?" The clarity and direction that comes from segmentation of channel data is invaluable to help your recruiting team focus and drive the right sourcing investment decisions. Quality is a critical layer to understanding and measuring Channel Effectiveness. If candidates aren’t progressing beyond interview stage or hires underperform or leave within the first year, you may be over-investing in a source that by volume metrics alone, looks like it is performing well. 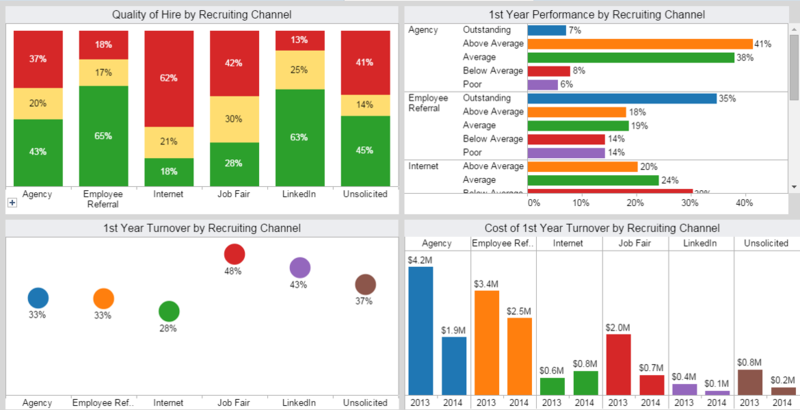 By connecting recruitment data to first year outcomes data (performance, time to productivity, turnover), and survey data (quality of hire, engagement), you can clearly see which channels are driving not only the highest quality candidates, but also the best fit hires. This information is invaluable in identifying areas of focus and informing investment decisions. Channel Effectiveness Analytics provide the insight needed for purposeful conversations about your recruiting source strategy. With visibility into volume, conversion rates and measures of quality you can have targeted discussions with your channel partners about what’s working and not working. With analytics drilled down to the specifics of the business requirement (role, region, department) you have the support you need for conversations with stakeholders around expectations, areas of focus and investment. Overall, the analytics provide you the confidence to communicate effectively and drive the best recruiting source strategy for your business. IF YOU KNEW THIS…WHERE WOULD YOU FOCUS? Which recruiting source can deliver the highest volume of quality candidates for growing your technology team needs. Your highest performing marketing hires were predominantly sourced from two of the four job boards typically used. Your highest performing recruiting source for your operations team varies widely depending on geography – on the West coast, LinkedIn has been highly effective, on the East coast, agencies have delivered the highest quality candidates. Channel Effectiveness Analytics are a powerful asset – to focus your evolving talent acquisition strategy, adapt your recruiting process, and communicate with the business.